The terrified shake caused by earthquake was felt in a calm early morning of April 18 at 5:15 AM. 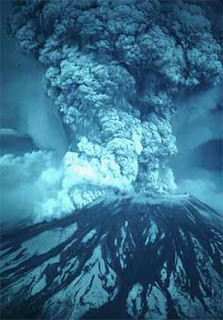 The earthquake lasted only for a minute but remarkably it is the worst earthquake in US history. Recent Scientific analysists estimates it the earthquake was registered as 8.25 on the Richter scale (By comparison with other earthquake which hit San Francisco on October 17, 1989 registered 6.7). 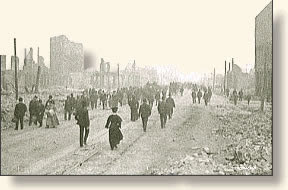 The following are said by the people who survived th earthquake in April 19th, 1906 at San Francisco. This was one of the earthquake cause by the San Andreas Fault but it havn't showed its power it was not its exact power or potential, Which was explained clearly in my previous article San Andreas Fault. Survivors cried along the streets for help in San Francisco. The morning begins with the greatest destruction came from the fires the quake which ignited Shops of San francisco. The city crumbles for three days without any help. 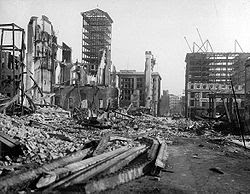 It destroyed about 490 city blocks, a total of more than 25,000 buildings, made over 250,000 homeless and death toll is between 450 and 700. Damage has been estimated about $350,000,000. Famous Bussinessman Jerome B. Clark lived in Berkeley along the bay of San Francisco. He experienced a minor shake-up at his home in the early morning but this did not stop him from making his regular trip to the city. He describes what he saw as he disembarked from the ferry. As the fires gained total control of the city and the city's water system destroyed, survivors gathered where ever they could find water. All through the night victims huddled together in the open air as flames lit the sky. "Of a sudden we had found ourselves staggering and reeling. It was as if the earth was slipping gently from under our feet. Then came the sickening swaying of the earth that threw us flat upon our faces. Big buildings were crumbling as one might crush a biscuit in one's hand. Ahead of me a great cornice crushed a man as if he were a maggot - a laborer in overalls on his way to the Union Iron Works with a dinner pail on his arm." (P. Barrett). 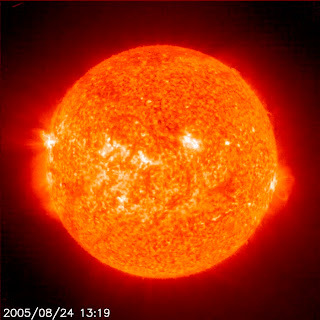 The next one which was predicted by the scientists is also called as th destiny by scientists. The government is well aware of the danger and it keeps its service always prepared recently, it conducted a trial of earthquake to make awareness among people, police, firemen. 2012 ?? One More in San Francisco ?? The Golden Gate bridge and Oakland bay bridge are reconstructed and repaired recently has several features to survive the upcoming earthquake the contract person said that it has bee designed to survive an earthquake about 7.8 in Richter scale. Because the oakland Bay bridge was built strong enough to survive the earthquake but it was destroyed by earthquake in 1989, then it is repaired and opened within a month for traffic. The major caution is this may also include LA and mexico. As we know we are the ever known best living things in earth we are always a step ahead in scientific developement but always nature is a step ahead of us . feel the day is coming soon..